This Sunday is the second round of the Pandanet-AGA City League. Watch heavyweights from the A League including professionals like Ximeng Yu and Ryan Li, the AGA’s newest pro. “Don’t discount our B and C Leagues; they will be duking it out with the other teams,” says Steve Colburn. Check the schedules for your local team. Watch your local team play this Sunday in the AGA City League. Games start at 3PM EST Sunday. Make sure to check out the latest GoPanda2 client as well; it has been updated recently and has new features. This is the last week to sign up your city’s team for the upcoming year of the Pandanet-AGA City League. “We almost have a full roster for this season,” reports League Coordinator Steve Colburn. Any information can be found on the rules page or at steve.colburn@usgo.org. 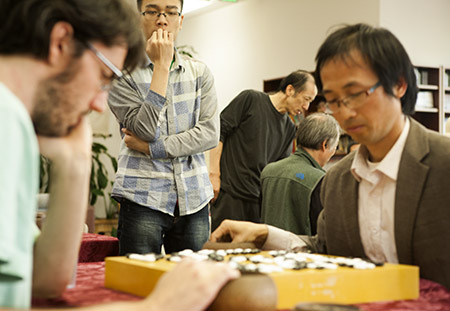 Registration continues for the 2014-2015 Pandanet-AGA City League. “We’re looking for more teams” in expanded A and B Leagues, reports TD Steve Colburn. Those leagues are expanding to eight teams each. Teams have until Sunday September 28th to send in registrations. Colburn is also looking for a League Manager to help during the year. All teams should contact Steve.Colburn@usgo.org for more information. Keep up with breaking news at the 2014 US Go Congress by following us on Twitter @theaga and Facebook at American Go Association. New York City. In other A League results, Greater Washington won 3rd place and Boston was 4th. New York City took first place in the B League, and Chicago was second. Play is still ongoing in the C League, where Katy TX 1 is currently leading with an undefeated score. They are followed by Canwa Vancouver 2, Katy TX 2, and Brentwood/Nashville. Round 6 will be played on Saturday June 17th. 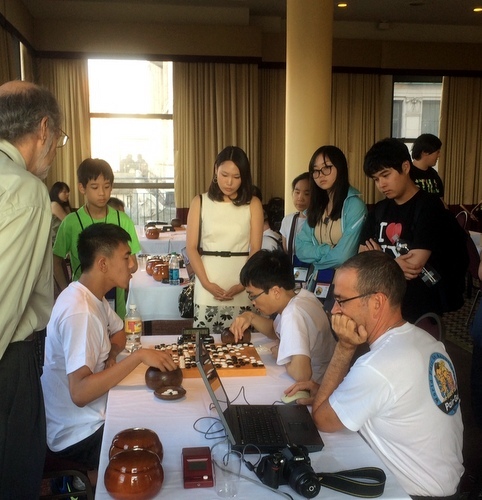 The game at right is the one that put Seattle 1 into the finals, with Seattle’s Ho Son (B) defeating Greater Washington’s Jie Li (W) in what turned out to be the tie-break game; as this game was played both cities had won a game (Board 1 – Seattle 1, Board 3 – Greater Washington).